A crimping tool and base mold made from polymer clay, used to shape paper cases for dolls house miniature chocolates and candies. Photo copyright 2010 Lesley Shepherd, Licensed to About.com Inc. Although you can paint faux baking cases or baking cups on dolls house muffins and cupcakes (fairy cakes), sometimes you need a pastry case to show off special pastries in a bakery or tea shop scene. The same technique used for making cases suitable for cookies and pastries, can be used to make case suitable for smaller miniatures, like scale chocolates for a chocolate box. Making the molds is fairly easy, but the cases will only work if you make them from a suitable thin paper. The molds for these cases can be made from either polymer clay or silicone mold putty and marettes. 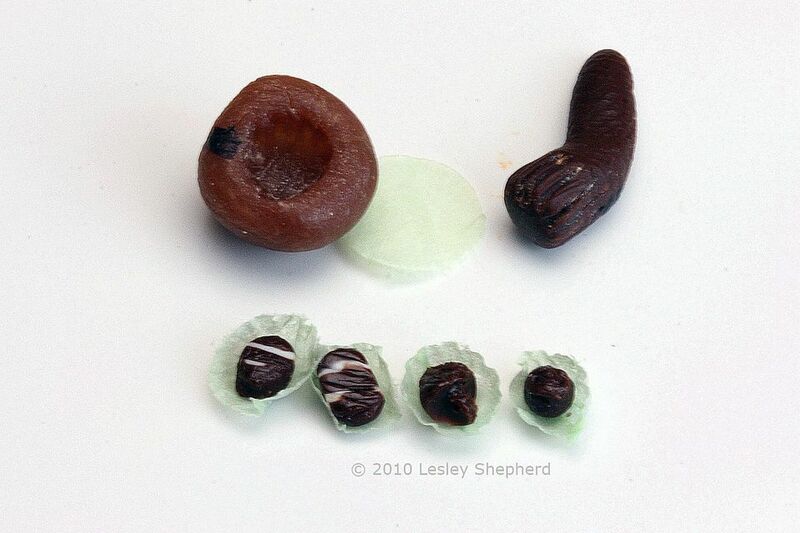 If you want to make cases for tiny miniatures, like the chocolates shown above, you will need to carve the fluted mold on the end of a toothpick or on the end of a roll of polymer clay. 1/4 and 1/2 inch circular punches and tissue or tracing paper used to make dolls house scale pastry and chocolate cases or muffin cups. Photo copyright 2010 Lesley Shepherd, Licensed to About.com Inc. The pastry cases shown in this tutorial were all made using either stiff (glazed) tissue paper or tracing paper, cut with paper punches. The lightweight papers must be punched with a regular sheet of printer or notepaper as a second layer in the punch, or the light paper will tear and not come out as neat rounds. The muffin cups/ cupcake liners / baking cups suitable for muffins and cupcakes, were made from 1/2 inch circles punched from tracing paper and tissue paper. The chocolate cases were made from tissue paper cut with a 1/4 inch circle punch. Choosing the Right Papers - To make these tiny pastry cases successfully, you need a paper which is fairly crisp, but very thin. Stiffer or glazed (shiny) tissue papers work well, as do onion skin papers or artists tracing papers (provided they are not too thick). If the paper is not crisp enough it will tear when you try to remove it from the molds and it will not form neat fluted lines. Tip If your case sticks in the mold after it is shaped, you can use the blunt end of a fine crewel or darning needle to gently work it away from the mold until you can remove it with a pair of fine pointed tweezers. If you cannot get your paper and mold to work together with the shaping tool (see next step) you can center a circle of paper over a mold and use a blunt ended darning needle to work the paper into the flutes of the mold to shape the pastry case. Dolls house scale pastry case (cupcake papers or liner) molds and a chocolate paper mold made from polymer clay and two part silicone mold putty. Photo copyright 2010 Lesley Shepherd, Licensed to About.com Inc. In the photo above you can see three ways to make molds for paper pastry and chocolate cases in dolls house scale. Shaping Silicone Putty Molds on Electrical Marettes - Using Two part silicone mold putty you can make a flexible mold which makes it slightly easier to remove the paper case for your dolls house miniatures. To make these molds you will need mold putty and a small electrical marette (or another suitable sized fluted shape). Marettes are used wherever two electrical wires are joined together. You will find them in a range of sizes in hardware and electrical stores. Try the smallest marettes first to make sure a 1/2 inch paper circle will make a case. To make the mold, mix a small amount of putty into a ball following the directions for your putty. Press the ball gently onto a flat surface and insert the closed top of the marette as shown above. Depending on the size of case you wish to make, you will need 1/4 of an inch of marette at a minimum, covered with putty. Level off the top of the putty as much as possible and press it tightly to the marette. Leave to set. Carefully mark a line on the edge of the mold using an indelible marker and carry the line onto the marette. (see photo above). This will help you line up the marette and the mold when it comes time to shape the pastry case. Carefully remove the marette (and keep it with the mold). Shaping Polymer Clay Molds on Electrical Marettes - You can use a similar method to make molds from polymer clay. You will need a marette as in the first method, but you mix a ball of waste polymer clay, coat your marette with a release agent (corn starch or talcum /baby powder), shake off the excess powder, and carefully press the marette into the clay, trying to push it into place without wiggling it from side to side. Hold the polymer clay in place on your baking tile or tray with tweezers across the top of the clay, while you pull the marette straight out of the clay to leave a clear impression behind. If you wish you can mark the unbaked clay and the marette with a match line as for the silicone putty method above. Bake the clay according to directions for your particular brand. See the next step for shaping the paper circles into fluted cases. Making Molds For Smaller Cases Without Marettes - To make smaller scale pastry cases or cases for chocolates and candies, you will need to first carve the fluted shape. You can carve fluted lines in the end of a narrow wooden cylinder, a 1/8 inch cylinder made of epoxy putty, or a cylinder made of polymer clay. Roll out enough clay or epoxy putty to leave a handle you can hold the tool with, or leave one to two inches as a handle on the wood cylinder you will carve. If you are carving polymer clay or epoxy putty, harden the cylinders and then use a craft knife or a polymer clay knife to carve in fluted lines (see the sample above with the chocolate cases). Once you have the fluted tool, make a mold from putty or polymer clay for the other half. Dollhouse scale molds made from carved polymer clay, or electrical marettes used to make cupcake or muffin liners (pastry cases) and cases for dolls house scale chocolates. Photo copyright 2010 Lesley Shepherd, Licensed to About.com Inc.
Center the paper circle over the opening in the mold you made from silicone putty or polymer clay, and press the paper circle gently into the mold using the matching marette or the fluted tool you carved for the tiny chocolate cases. (see photo above). Remove the pressing tool or marette, then use tweezers to gently remove the paper pastry or chocolate case from the mold. If you have trouble centering the paper on your mold, make sure the top of the mold is as flat as possible, and fold a punched circle into quarters to mark the center. Line this up with the center of your mold and mark the mold to show where the edge of the circle should be placed. If your mold shrank when baked, or no longer fits the marette or tool it was shaped from, you can still use it to make pastry cases. Press the center of the paper circle down into the mold using a rounded embossing tool or rounded toothpick and use a blunt ended crewel needle or darning needle to press the edge of the paper circle into the flutes on the side of the mold.